We took a break from the beach for a day and took a trip to Kinston, NC. Huh? Where? Yay, I know. Never heard of it either…until we watched some local TV. What’s in Kinston? Well, a celebration of eating local, of bringing the farm to the table. We love PBS. What does that have to do with it? Well, Jordan and I got hooked on a series airing here in NC called “A Chef’s Life.” It features chef Vivian Howard and the restaurant she and her husband run (the restaurant is called Chef & the Farmer) in small town USA – Kinston, NC. Vivian Howard’s focus is to feature local sources of foods – seafoods, vegetables, fruits, beef and so on, serving them up with flair and style all while trying to revitalize her hometown. 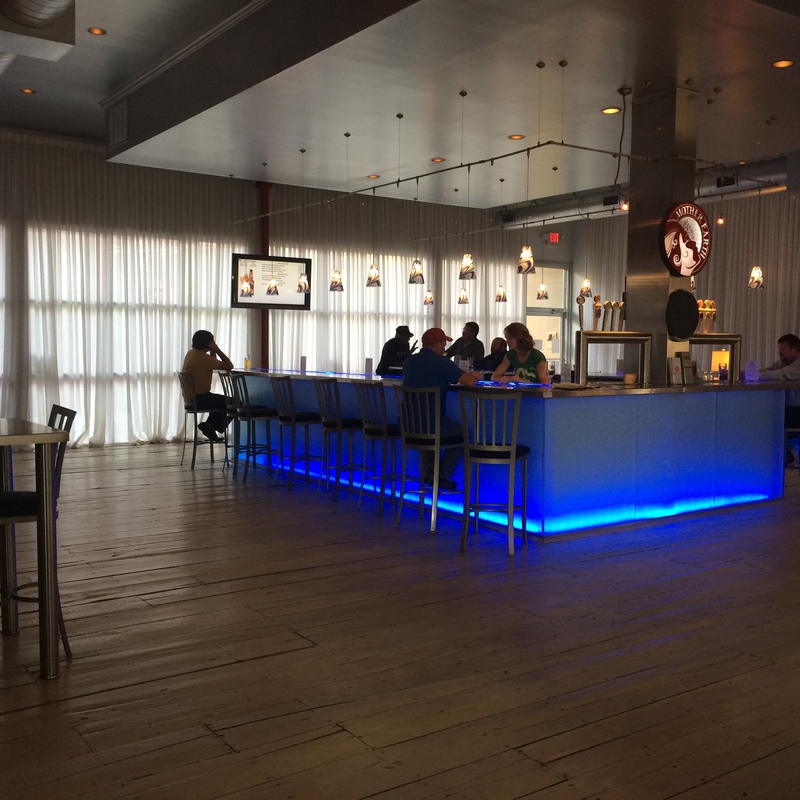 The show also showed the couple starting up a bar called the boiler room, offering a different take on an oyster bar. The show follows the team’s creation of menus, follows them to the farms and captures their interaction with local farmers and purveyors of proteins, and traces the planning and eventual opening of their new bar. We were hooked and pleasantly surprised to find a trip to Kinston to check out the actual establishments wouldn’t be all that difficult. 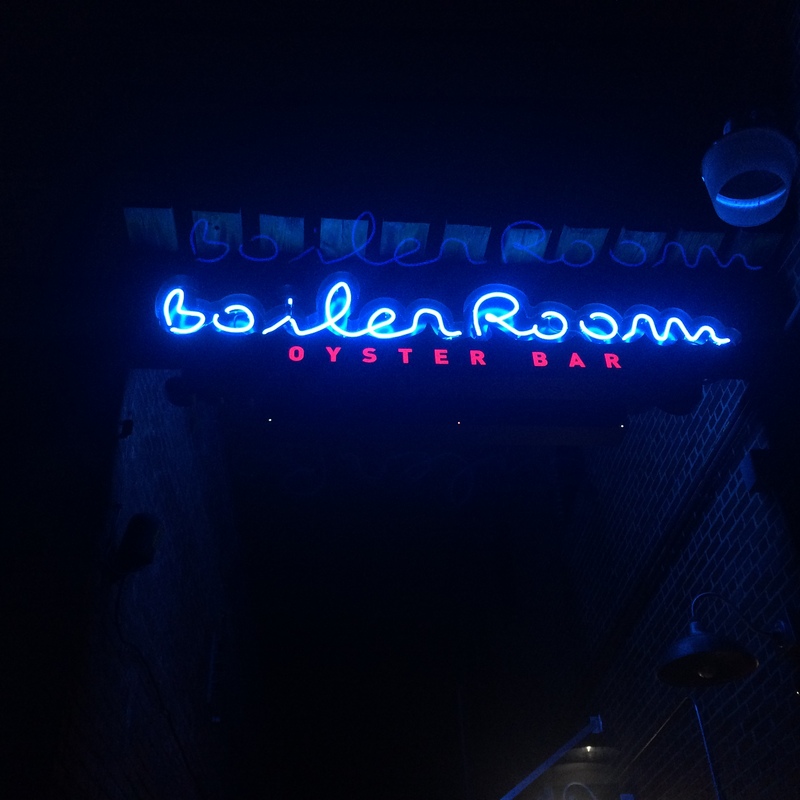 So…we went on a PBS inspired culinary adventure to visit the boiler room oyster bar and Chef & the Farmer restaurant. First stop was the bar, the boiler room. Industrial, clean and sleek. Very cool interior. But we were there for the food. A half peck of steamed oysters and a butterbean burger were ordered……and devoured. I don’t eat oysters. They aren’t my go-to choice of seafood, but these monsters were succulent. We had served with the oysters fresh horseradish, cocktail sauce and delicious lemon infused butter as well as some amazing homemade saltines. I was converted. 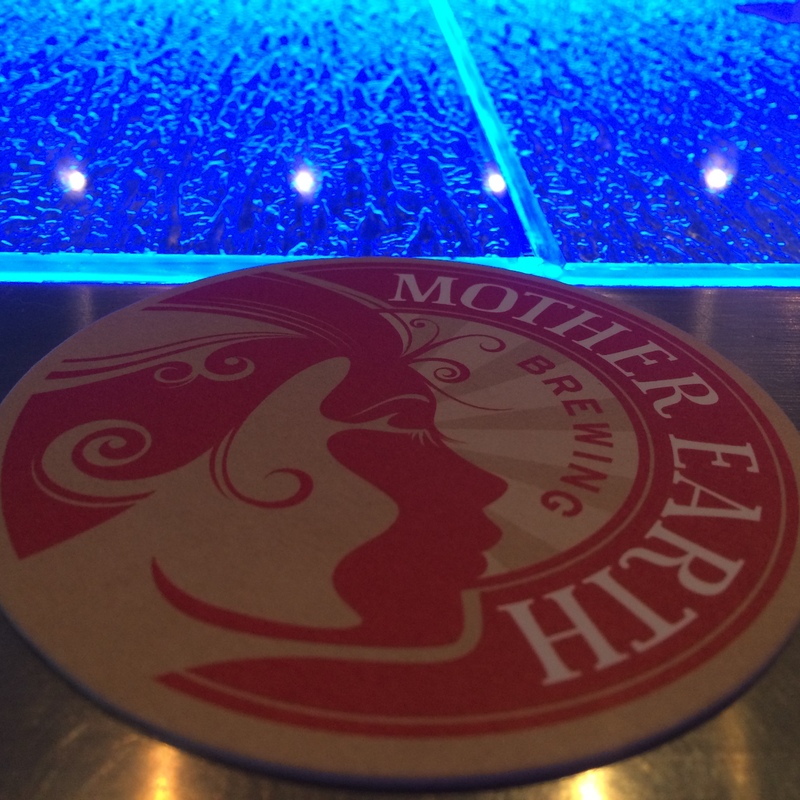 To wash these guys down, we ordered beer from Mother Earth Brewery…the brewery conveniently located across the street. As for the main dish, the butterbean burger (we watched the episode that gave birth to this burger), was absolutely delicious. You’d never know it was a bean based burger. The bartender was kind enough to book us a table across the street, and with time to spare, we decided to check out the neighborhood brewery. “To the entire Mother Earth family, life is an art, and it requires artfully-crafted beverages with which to wash it down. Whatever your passion, make sure you’re doing it with the ones you love. This company’s greatest hope is to have the privilege of simply being invited along. The brews all were fresh and delicious. The tap room was super cool. We are heading back to Kinston Saturday, on our way back home, to spend a little time at MEB’s 5 year anniversary party. It just sounded like too much fun to ignore. 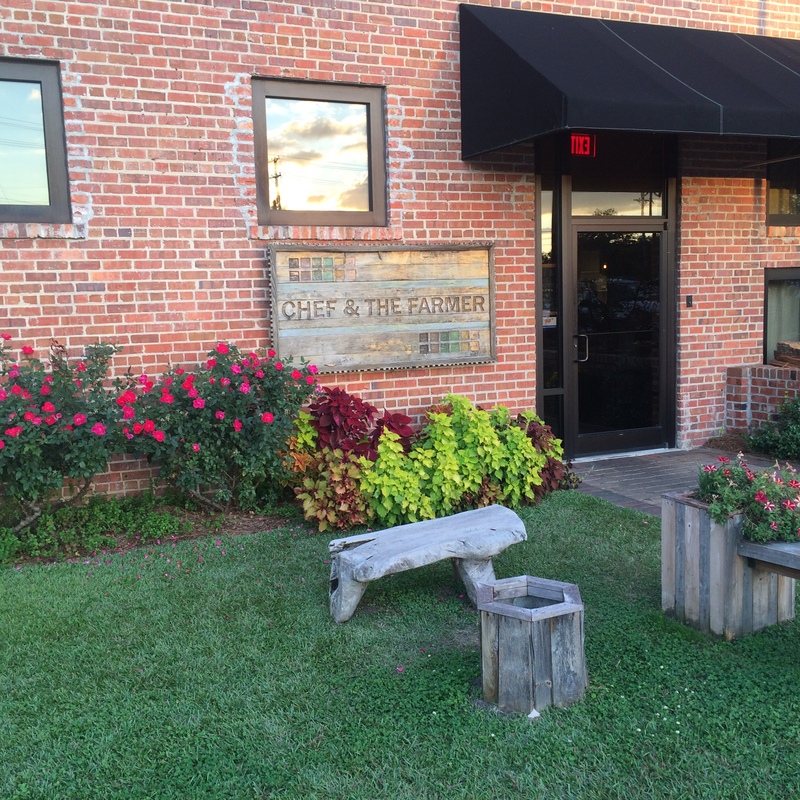 After hanging out at MEB for a spell, we walked over to Chef & the Farmer restaurant. Mind you, this was Wednesday. Our reservations were at 6:30….and we were glad we had them. The place was HOPPING!!!! Very cool interior. Bar. Open kitchen with a community table running in front along the prep area (prime viewing of all the cooking). Gas/wood fired stove. Incredible vibe and vitality. Place was humming. We decided to sample each section, sharing between us the kitchen offerings. We started with peach BBQ pork belly kabobs followed by a country ham and kershaw squash risotto (brought both out at same time). I lost my head with the excitement of the place and the anticipation of it all and neglected to photograph the restaurant OR these two dishes. It doesn’t matter though. Both dishes disappeared in seconds. The pork belly – succulent. Could taste the peach in the glaze. The meat literally melted in your mouth. Cilantro sprouts as garnish added a great spice to the tasty meat squares. The risotto was equally as amazing. The country ham was salted but not to the point of making you pucker. 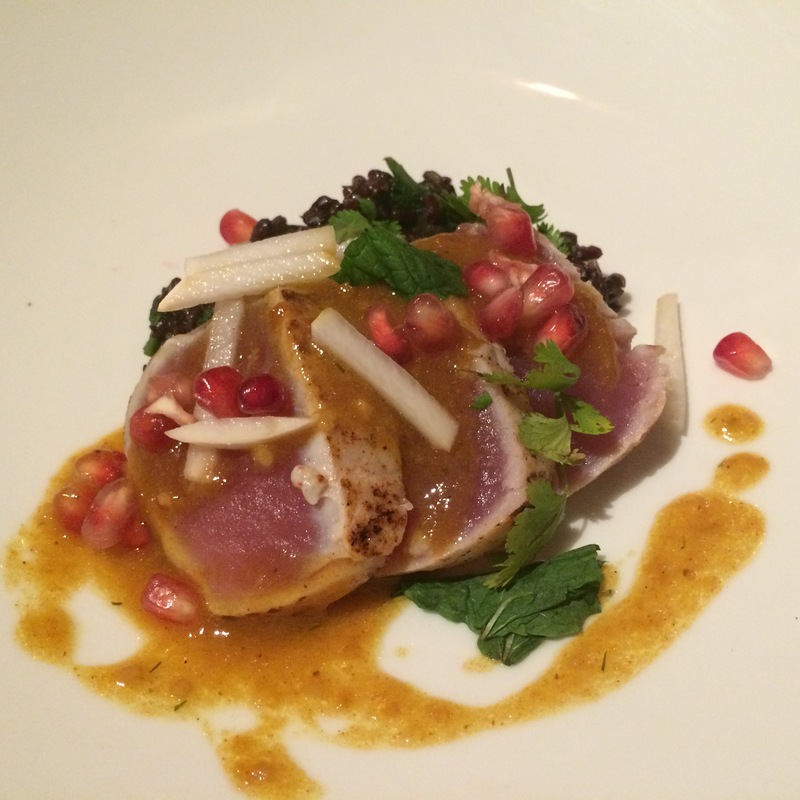 The dish was smooth, creamy, and so stinking good. AMAZING!!! The white was kohlrabi strips which added a nice crunch and flavor. The black rice had a little fresh parsley and mint. The persimmon sauce also had a hint of curry. The dish was simply delicious. People, I don’t eat oysters. I don’t eat tuna. That night I did. Part of the fun (and one of the reasons why I love Jordan) is to go outside of your comfort zone. Jordan and I always try to sample the local fare and to pick things we wouldn’t normally get in our neck of the woods. This night, I was way out of my comfort zone and LOVED it. So very worth it. We finished with some delicious coffee, a muscadine cobbler with goat cheese ice cream (WHAT? It was wicked and cut the cobbler’s sweetness just right) and a mocha something parfait. Sounds and looks so amazing. 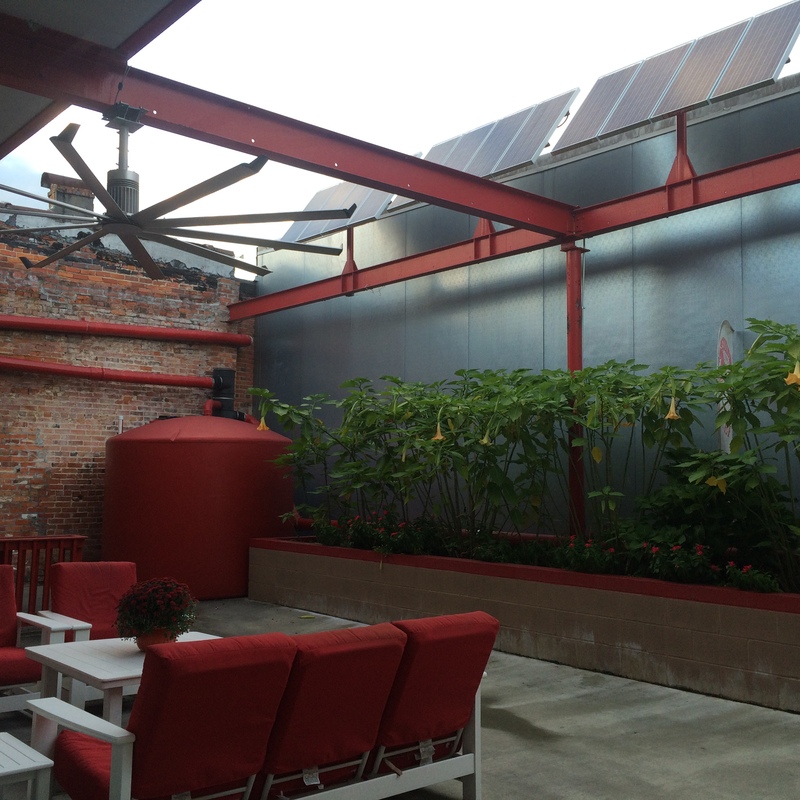 We had a similar experience at The Admiral in Asheville, NC last week. Similar vibe. Ceveche and bacon creme brule among other treats. Good to be adventerous! It was so much fun! And amazingly delicious. We split everything and they were kind enough to bring out two separate plates. Just really really nice. Good to know about Asheville. We some times make a point of driving through there to get back home. Such an interesting city to explore. Always helpful to know where to look for new adventures.